OK, I’ve seen this odd chair from Pottery Barn before. I may have even laughed and wondered who would buy something so bizarre. Except now? I really want one. It offers privacy, shade, durability, and comfort. And it’s definitely interesting to look at. I imagine it tucked away in a quiet corner of the garden, surrounded by peonies. I would grab a magazine and a glass of lemonade and go out there to relax. And how sweet would it be for curling up and reading children’s books with a little one? *ahem* Not that we have a little one… yet. as someone who is pale as a ghost and burns in a snap but loves to be outside, i find the idea of curling up and reading in that pretty appealing myself! alas, i don’t have my own yard yet — but i do like it! I’m too practical for this space capsule. All I can think of is the effects of weather and passing birds. love, love, love it! i’m a huge fan of cozy little places to curl up in and this one would suit my needs just fine! I agree that it is oddly appealing. Although, I really just want to sit in it and put my arms out the holes on the side. i kind of like the idea of having it inside the house. I like the look of them, but fear they would be dreadfully uncomfortable! Anyone ever sat in one? I have sat in it..it is a bit too shallow to be very cozy and comfortable unless you are a kid or petite. Its too bad, its is adorable. Love the chair – a little pricey but lovely. And I know what you mean about little ones – we don’t have any yet either…yet. :) Our friends are all having them and keep nudging us and some days I want to start a family and other days I couldn’t imagine it. I do like it, but it could be like the VW Bug- cute but weird once you get inside it. It is really cute! I’d love to have one. My yard isn’t really too big but I could def fit one of these in it. Maybe I will get my Mom to put one in her backyard oasis! She has a pool & everything, so I could totally lounge in this poolside. Whatever that drink is in the pic looks good too! I think it looks great, but I need more of a lounging piece in the garden. How would you nap in that? I am 5’5 and slim and with pillows it was too shallow to get my feet up into it..without pillows its not comfortable. I remember chairs like those being around in the 60’s- 70’s, when I was I kid. I always thought they were so cool. Love it!!! A couple on my deck with some flower baskets around them would look awesome. If only we had a Pottery Barn here! personally… I LOVE IT & WANT ONE AS WELL!! Oh, this is cute! It reminds me of the chair that Will Smith had to sit in in that movie, “Men In Black”, only cuter! I can totally snuggle in that! I love it! A good egg! It is totally spaceship like with those windows! I want it!! Not that I could afford it, but why doesn’t Australia have a Pottery Barn? I just want to sit it in it and see what it’s like! 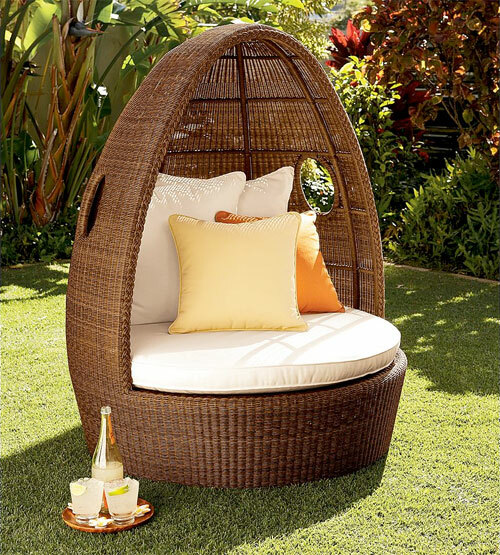 I could imagine spending a lazy afternoon sipping lovely fruit cocktails reading a fabulously trashy novel, all in the comforyt of my little egg seat. I’ve seen hanging version similar to this. I’d love one of them – however as someone else said, practically – I can see it covered with bird poop. Ick! I want it , too ! I love it ! Yes, I looked at that too and these sort of pod like chambers seem to be popping up all over. I like that it has a cocoon sort of shape, nice for sitting and for laying an egg of an idea in a journal or reading a great book. OK, I’ve decided that this chair belongs in my garden. I’m just waiting now to see if the price will go down at all. I saw it at PB too, and loved it immediately. Just one problem – how the f*** would I ship it back home overseas? :-( No egg-chair for me…. That is SO cute! Looks so cozy – I wish I had an egg chair too! If you want an egg shaped retreat in your garden during my vacation in England there was a willow cabin in Anne Hathaway’s house that was really pretty. If you want to see pics it’s on the third page of my album http://www.facebook.com/photo.php?pid=644651&l=2b2ef&id=500016047.